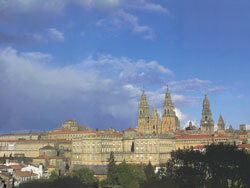 Learn Spanish in Santiago de Compostela, and experience a city of unique architectural beauty. With innumerable palaces, monasteries, squares and historic buildings dating back over 1000 years, our Spanish language school is situated in one of the most beautiful and historic cities in Spain. Vist Santiago de Compostela and sample the fine Galician cuisine and wines and discover this university city’s vibrant cultural life. Santiago is also an ideal base from which to explore the natural beauty of this ‘undiscovered corner’ of North West Spain, with its snow-capped mountains, green valleys and unspoilt beaches. Although Santiago de Compostela is famous as the final destination along the Camino de Santiago, or St. James's Way, this is a great location for students wanting to experience real life in Spain, as the city is still largely untouched by tourism and the majority of visitors to Santiago de Compostela are Spanish themselves! Our Spanish language school in Santiago de Compostela is located in the beautiful historic centre of the city, just a few minutes walk from the cathedral and the narrow streets of the Old Town. The school has 6 classrooms, with free wifi access available throughout the building. 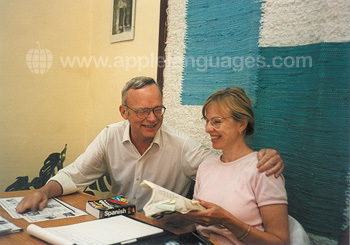 You can learn Spanish with an ‘Intensive’ Spanish course, consisting of 20 lessons/week, with a maximum of just 10 students per class. Alternatively, you can choose a ‘Super Intensive course’ course, which is a combination of the ‘Intensive’ course, with 5 extra lessons focusing on oral communication skills. Students can also combine group lessons with additional private lessons, or book a course of private lessons on their own. Our Spanish language school in Santiago de Compostela also arranges Work Experience placements, for students who want to stay on in Spain after finishing their Spanish course. The programme includes 2, 4 or 8 weeks of Spanish lessons followed by 8 weeks of work experience. 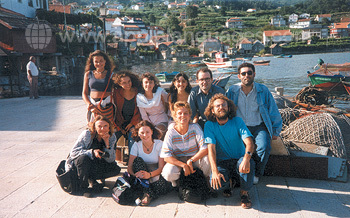 Typical placements include: tourist information offices in the city; tourist promotion of Galicia; city museums; farming cooperatives, travel agencies; and hotels. This programme is designed to give students experience of using their Spanish practically in a work environment. 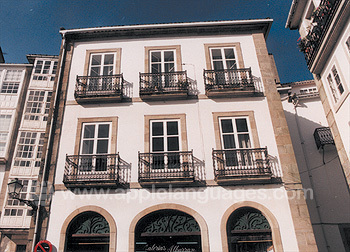 Spanish host family accommodation in Santiago de Compostela is a really popular option with students hoping to meet local people during their stay. Host families are available on a half board basis (2 meals each day) and mealtimes provide the perfect opportunity to chat with your hosts and practice your Spanish language skills! We can also arrange accommodaton for you in Santiago de Compostela in a student residence, or if you would prefer to cater for yourself, in a shared apartments with kitchen access. Like all our schools in Spain, our Santiago de Compostela school organises a cultural program, including social evenings, cinema trips, Spanish cookery lessons, Spanish music evenings, beach trips and excursions to various locations within Galicia. 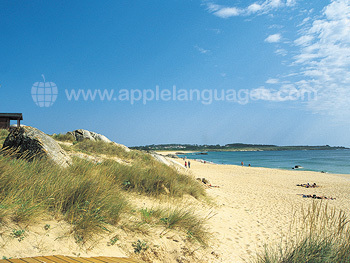 The school arrange at least two different activities each week and the activity programme is designed to give students plenty of opportunity practice Spanish in real life situations and discover Santiago and the beautiful region of Galicia. The airport in Santiago de Compostela is located just 10 km away from the city centre and has flight connections from many major airports. Our school can arrange airport collection from Santiago Airport, for students who wish to be met on arrival. Average score for our school in Santiago de Compostela based on 43 previous client reviews. The course was really good, what I expected. The staff were very competent. The excursions were fun and informative. Accommodation was very good, very central, short walk to the school. Food was excellent. Staff very friendly and helpful. Being immersed within the spanish language was very useful although on Day 1 this was quite difficult to adjust to as a beginner. However, I realise how significant this process was for learning and felt that by the end of the week, my auditory understanding had improved. I know confidence in speaking will only come over time with considerable practice. The teacher Laura, was very patient especially as I was the oldest person in our class of three. Her structure and timekeeping were very good. I stayed with a host family, Mrs Carmen Montero for almost a week. She was very welcoming and friendly and made me feel very much part of her family. As a vegetarian, she made the best spanish tortilla I have ever tasted! I really enjoyed the course and wish I could have participated for longer. Santiago de Compostela was a wonderful city to be based and will definitely return. Laura was a great teacher. She was very accommodating to our different needs and it was a great grounding to go forward with. Marisa and her son were so welcoming & made me feel like being at home. Great home cooking and lots of opportunity to practice Spanish. Just would have liked to stay longer! The classes were FANTASTIC! I wish I could have had more than one week here. Our professor carefully drew us through our lessons, going at the subject in varied ways until we all got it! The accommodations were also wonderful. A fine family, delicious food, typical for Gallecia.... Simply wonderful! I would highly recommend this school as it is a wonderful place to study Spanish. The teacher was excellent and the atmosphere in the school was very friendly and relaxing. The best thing about the school was the small number of students in each class. Santiago de Compostela is one of the most beautiful cities I've ever visited. 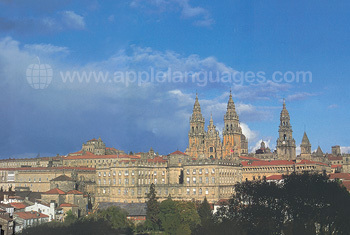 I have done about 40 language courses in 7 different languages in the last 35 years, a lot more than half through Apple languages, and I must say that that the best food and accommodation was joint best in Santiago de Compostela. (The other been in Odessa, in the Ukraine, which I booked directly). School is top class. The activities very well organised. I cannot speak too highly of the hard working staff. My accommodation was with a very welcoming family. 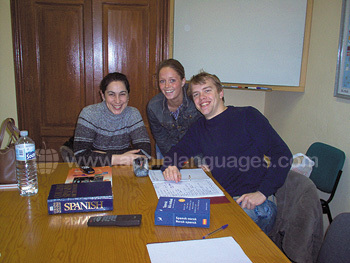 The course was well put together and, through having small classes all students were able to improve their level of Spanish. The flat I stayed in was clean, close to the school and excellently maintained. I found it very enjoyable and interesting. Especially the flexibility in the class to explain individual problems, the approach altogether of dealing with one subject each week and the expertise of explaining grammatical issues. We always had time and I never felt rushed or stressed. It just made studying fun. My host lady was very helpful in every respect and totally flexible as well. It was totally acceptable, the food was very health which is excactly what I like. Highly skilled professors who focus on building a good relationship with students and encouraging them to talk in Spanish as much as possible. Excellent care, food and company - I recommend the experience wholeheartedly! I was very pleased with the friendliness and professionality of my teachers. It was great that we were few people in the group, so I could profit a lot. Very enjoyable experience! Learnt loads at the language school, the teachers were very friendly and helpful and the activities organised were interesting! Host family were friendly and welcoming, clean flat, very nice food! I had a great time at the language school! The course was really good. The staff at the school were very friendly. I don't know how the receptionist, Rosa, rembered all our names! The other students were very nice. The excursions were very good as most people came on their own and it was a good way to meet the other students. All in all, a very good experience. My host was very welcoming. The only slight criticisms would be that the apartment and the breakfast was a little on the small size. Otherwise everything was fine. Excellent teacher, friendly, she worked really hard to get us through so much as complete beginners ~ all in a week! very patient with a great sense of humour. I stayed with a really friendly and warm family. The teacher, Rosana, was excellent. Classes were a good mix of comprehension - listening and reading - and practice speaking. Class size was good - 7 one week, 4 the next. Enough to practice with while few enough to feel intimate and fun. Santiago is a beautiful city, and Galicia has lovely countryside and coastline to explore. I recommend making a trip to the idyllic Iles Cies! My room in the residence was large and comfortable. the residence was located in a good part of town, an easy 10 mins walk from the school. Cleaned every day - great. I enjoyed my course immensely and found the staff at the school very friendly, helpful and thorough. I would recommend this school to anyone. The accommodation was very satisfactory, there was a mix up regarding the day of my arrival but the Principal of the school dealt with it admirably. Absolutely outstanding, could not fault either the school organisation or the teaching. Accommodation fine. I had the flat to myself, which was great, and it was clean and comfortable. The only improvement I would make would be to provide an ironing board to go with the iron! I'm a languages teacher myself, so I think I can spot outstanding teaching, and Laura would be a tremendous asset to any school, anywhere. My course had great value for its cost - the lessons were very informative, the staff were always helpful and willing to help with any problems, and the academy itself was well-stocked with more than enough supplies. There was a great mix of both language and cultural aspects to the course. The accommodation was very comfortable and there was more than enough food at mealtimes. The staff did a great job of looking after all of those staying. I was extremely impressed with the school. The teachers were absolutely wonderful! They were very patient and helpful and and always kept the class engaging and interesting. The apartment was extremely comfortable, clean, and in a nice location. It far exceeded my expectations. I would happily recommend the school to students of all levels of Spanish. My course was well organised and the school was well run. I had a lot of fun and would do it again! Although I was only there for one week I had plenty of opportunity to practise speaking Spanish which was something I really needed to do! Our teacher was very good and provided a variety of material in the class including lots of information about the region, customs, folklore and food. My apartment was extremely clean and comfortable, and very conveniently situated being within easy walking distance of the historic centre, a modern shopping mall and the main bus station. The programme of afternoon/early evening visits to the Cathedral and various museums was very interesting and I certainly feel as if I was able to make the best of my short time in Santiago de Compostela. I was very impressed, the staff were very friendly and helpful and the facilities were excellent. I thoroughly enjoyed the course. The teachers were very knowledgeable and patient. I felt the course used relevant information about the culture, people, and history of Galicia to teach the Spanish language. I will be recommending this course. My accommodation was clean and the food was good. I enjoyed visiting with Elena during meal times, and she was very helpful. Thanks for a great summer! We would recommend this school to anyone. The staff were extremely friendly but very professional and very skilled at working at the level each individual required. The staff accompanied the students for coffee each morning and arranged optional activites most evenings. This led to a very good atmosphere and enabled us to get to know other students. Very well organized courses, I made a lot of progress. After course activities were very interesting, it was the best part of the course, because we could speak to each other a lot. My accommodation was in an excellent location, a few minutes from school. Small, but cosy room with private bathroom. My host was very friendly and helpful and her cooking was excellent! I would have no hestiation recommending Apple Languages to anyone looking for a similar experience. I was so impressed I have bookmarked you for future reference. Keep up the good work, thanks for all your team's help & support, which contributed to making a new experience extremely enjoyable. I was really impressed with the course; the lessons were interesting and fun. I feel that my Spanish has greatly improved as a result, not only in terms of grammar and vocabulary but also in terms of fluency. My host family were friendly and welcoming and the meals they provided were substantial. The course was wonderful, the teachers were extremely friendly and professional and the classes lively and varied. I can't wait to go back, and hopefully do a longer course. Excellent teaching and organisation and the classes were very well structured and appropriate to students' needs. I stayed in a beautiful apartment with a very kind and welcoming family. Excellent food, service, facilities and hygiene. The course and school were fantastic. My host family were very friendly and the house was clean. Two weeks, two teachers, both excellent with different styles and personalities. I arrived knowing how to order a beer and left having hired cars, booked hotels, been to the market, discussed music, a brilliant kick-start to learning thenlanguage and a really motivating foundation for weekly classes back in my home town. My host was very welcoming and an excellent cook. She spoke no english so I had no option but to speak spanish and she had opinions on everything! Again, all of it was a great help in getting into the language, history and culture. I'm coming back! Everything about the course was very well organized and prepared; I learned a great deal. I will be back!